Although less than three miles from the scenic drive through Lassen Volcanic National Park, the Warner Valley region is 55 miles away by road, the last few miles of which are unpaved, so not many people make the journey. Most visitors, therefore, don't get to see two of the largest geothermal areas in the park, both reached by easy trails - these are Boiling Springs Lake, a 500 foot wide simmering pool surrounded by a ring of active vents, and Devils Kitchen, a varied and colorful collection of hot springs, fumaroles and mudpots. This section of the park also has a pleasant NPS campground and the Drakesbad Guest Ranch, a private facility offering fishing, horseback rides, dining, rustic accommodations and a thermal swimming pool. Several other locations are within reach of a day hike including Terminal Geyser, Drake Lake and Kings Creek Falls, though Devils Kitchen is the main attraction. Devils Kitchen topographic map, Lassen Volcanic National Park map. 12 views of Devils Kitchen. Features of Devils Kitchen (mp4; 1:15 min; 18 mb). The 15 mile Warner Valley Road starts at the friendly town of Chester on CA 36. The route is paved most of the way but rather bumpy and narrow in places, passing through thickly wooded land of the Lassen National Forest, climbing gradually and crossing a couple of streams on one-lane bridges. There are plenty of side tracks leading to clearings in the forest, ideal sites for free camping. The road reaches two small villages (Lee Camp and Kelly Camp), each with many small wooden lodges nestled between the tall trees, then becomes unpaved as it crosses the stony streambed of Kings Creek. 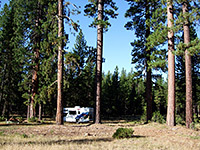 The park boundary is not far beyond, marked by a ranger residence and self-service pay station, after which the road steepens, winding over a hillside of large pine trees, past the Warner Valley campground and out into a flat, grassy area in the valley of Hot Springs Creek, the drainage that runs through Devils Kitchen 2 miles upstream. The trailhead for the hike is on the south side of the road a third of a mile before it ends at Drakesbad Ranch. Part of the trail (southwards to Boiling Springs Lake) is also the Pacific Crest Trail, the famous cross-country route that continues northwards a little way back along the road, next to the campground. The 2.1 mile trail to Devils Kitchen starts out by bridging the stream and climbing the hillside a little way to a junction. Turning right (left is to Boiling Springs Lake), the path leads through a patch of woodland next to the stream, crosses back to the north side, follows the creek a few hundred feet then emerges into open meadowland, rather marshy in some places. Another path joins on the right, used by horse traffic from the ranch - all of the subsequent trail is heavily frequented by the animals hence is rather smelly. The route continues through the meadow, partly over wooden boardwalks, and into the cool, dark forest on the far side, where it begins a steady climb over the next mile. There is one junction on the way, with a 1.2 mile path to Drake Lake. The forest opens out a little towards the end, either side of a small tributary stream, before the trail arrives at the rim of the main valley, below which is the thermal area. Horses must be tethered here, while hikers follow a steep path that descends to the stream and loops around some of the formations. Many of the larger pools in Devils Kitchen are somewhat out of sight at either end of the basin, but there is still much to see. 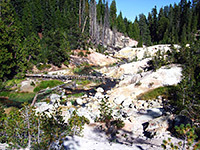 The region is about as extensive as the better known Bumpass Hell, and contains more thermal features, albeit most are rather small. 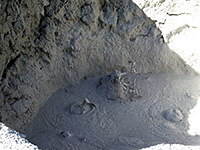 The kitchen has dozens of fumaroles, hot springs and mudpots, plus a boulder field where noxious gases vent out forcefully. 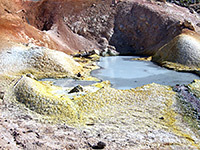 The yellow and red colors of sulphur are much in evidence, and the run-off channels have other exotic hues, of orange, bluish grey and green. One section of the path has been abandoned after new vents opened up close by, and the remaining loop is marked with several notices warning of the dangers of off-trail walking. Besides the fascinating thermal features, the basin is made more photogenic by the clear, fast flowing stream, the steep, mineralized slopes of the valley, and the bright green vegetation along the water's edge - definitely one of the highlights of the national park, and one usually enjoyed without any other hikers.